Last quarter in the class Structure, Properties and Deterioration of Organic Materials (CAEM 262), we completed practical assignments in order to understand how to identify and approach organic materials found within and comprising cultural objects. Each week the class studied a different category of organic materials including wood, paper and bark cloth, other plant materials, skin and leather, bone and ivory, plastics, and hair, quills and feathers. 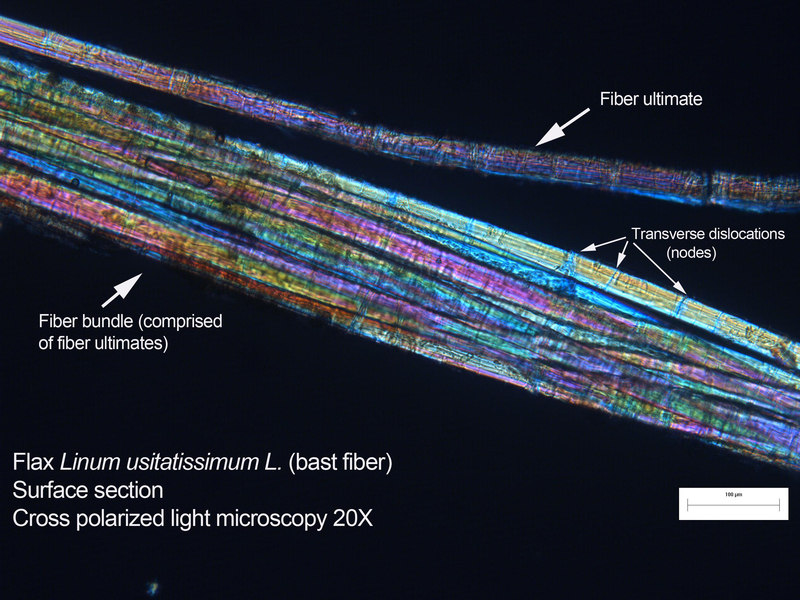 During our study of plant fibers, we utilized light microscopy, both with transmitted and polarized light, to view and identify fibers and diagnostic features of plants that could help in identification and documentation of materials used in the manufacture of objects. Different types of plant tissues and fibers can be used to produce a range of materials including cordage, baskets, paper, and native or conservation mends. The processing method of fibers may also be seen, and commercial fibers can usually be identified by their absence of impurities or extraneous material. An important reason for identifying plant materials is to understand their current state and how they may deteriorate in the future due to their inherent properties. 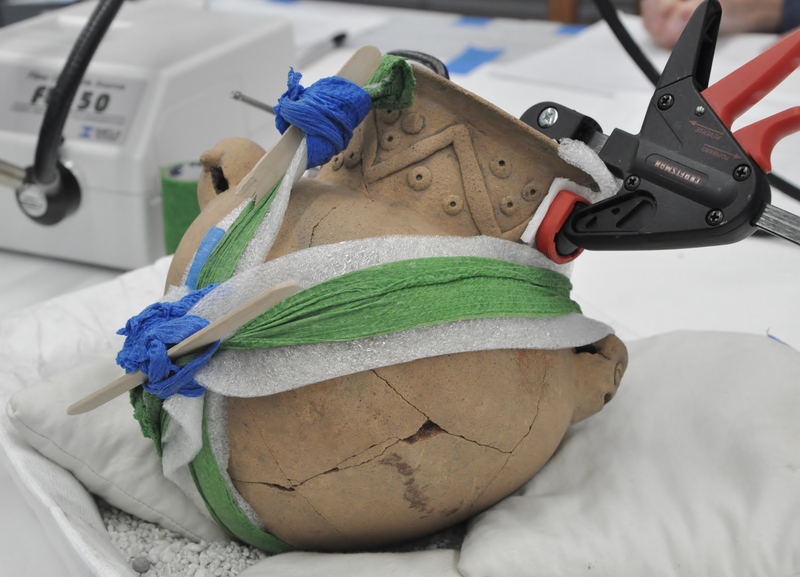 By studying and identifying the materials of which an object is made, as conservators, we will be to make more informed decisions about conservation treatment, repairs, stabilization and storage (Florian et al. 1990: 29). 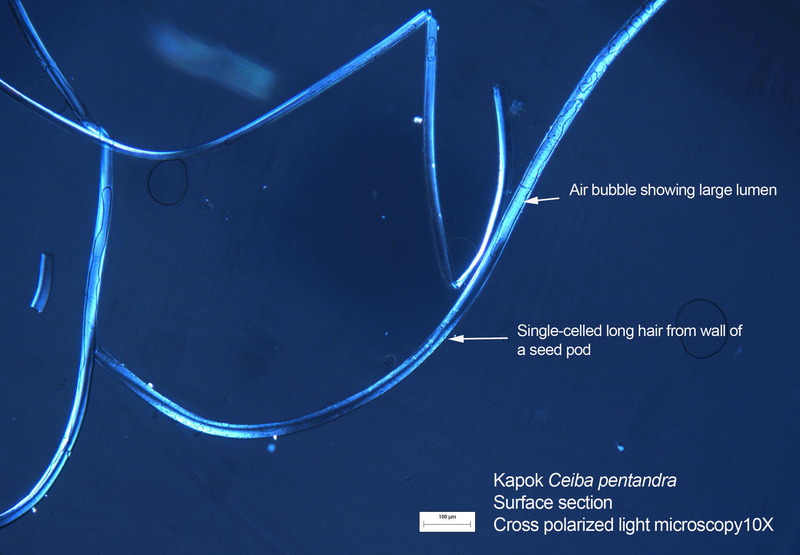 Using the UCLA/Getty Program’s vast reference collection of plant materials, each student chose and mounted on a microscope slide a surface section of a seed hair (fibers that surround plant seeds, like cotton or kapok), a surface section of a bast fiber (fibers harvested from woody stems, like flax or hemp), a cross-sectional sample of a monocot leaf (like palm) and a cross-sectional sample of a monocot stem (like a grass). 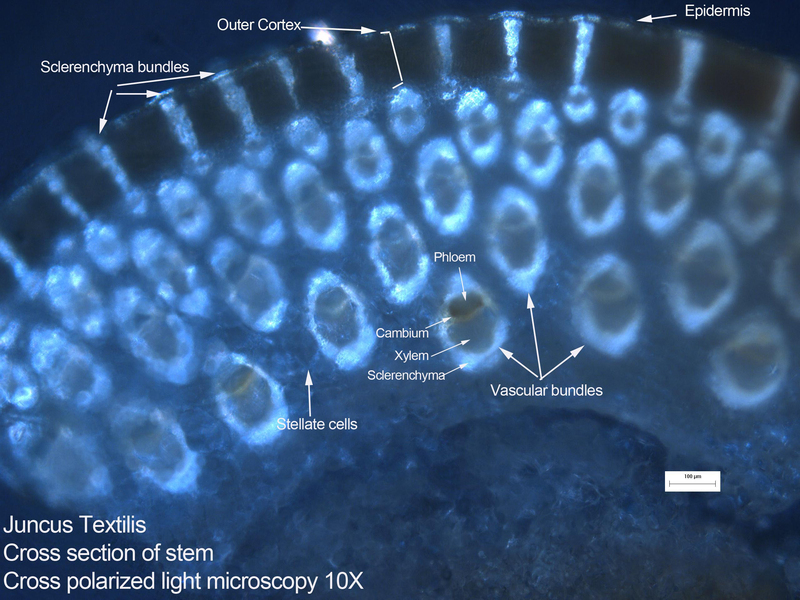 We then took photomicrographs of our samples and labeled the features that could be identified. Features that we were hoping to observe included tissue organization, cellular structure and details, and birefringent patterns and colors. 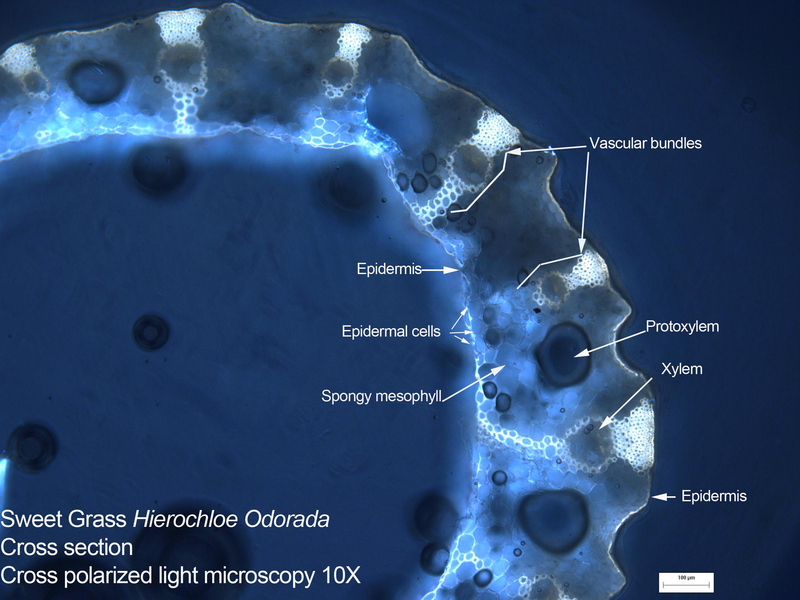 Below are the photomicrographs obtained using and Olympus BX51 microscope with transmitted and cross polarized light by Lesley Day, William Shelley and Betsy Burr. 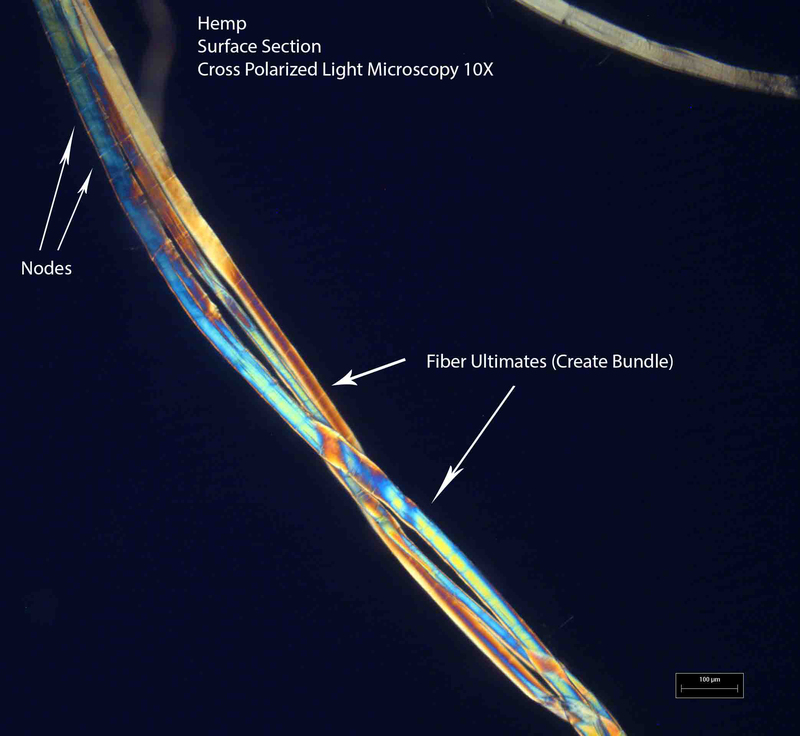 Polarized Light Microscopy (PLM) is very useful in identifying cotton and other seed hairs. 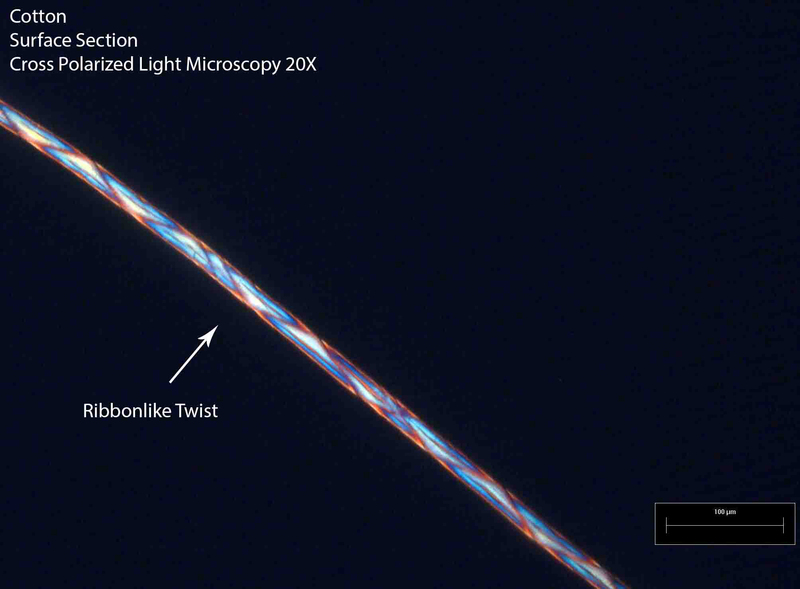 Cotton characteristically shows ribbon-like twists and birefringence. Cotton hairs are single cells that originate from the fruit or boll of the cotton flower. Other seed hairs such as kapok and cattail characteristically show few to no features, and lack of features can help in their identification (Florian et al. 1990: 40). Samples were prepared by teasing out a small amount of material and placing it on a glass microscope slide. A drop of water was placed on the fiber and covered with a plastic cover slip. Bast Fiber Surface Sections Bast fibers are long thick-walled cells harvested from the inner bark of hardwood trees. They are commercially and culturally important because they are used in cordage, basketry and paper. Flax and hemp are examples of bast fibers and are harvested from the stems of dicots. 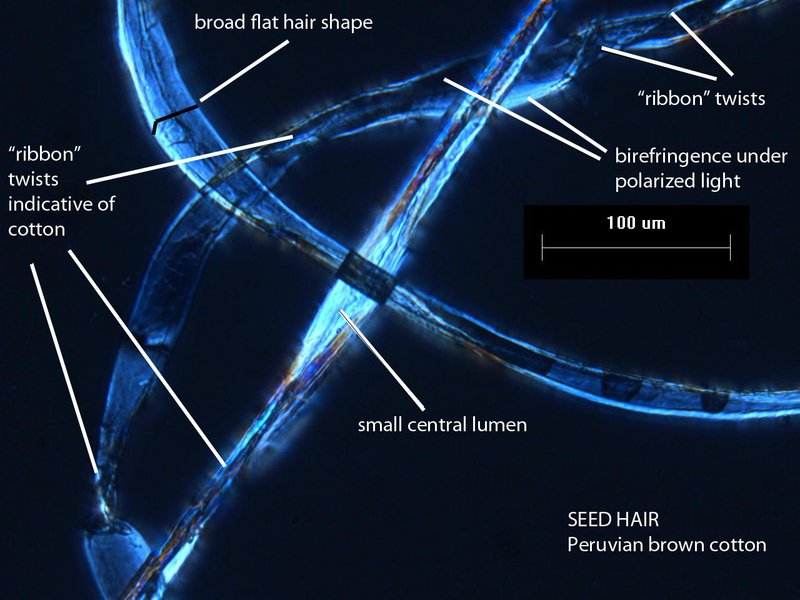 Salient features used to identify bast fibers are dislocations (also called kinks), long length, tapered ends and narrow lumens. The fibers usually occur as clusters, and the presence of single fiber ultimates may indicate more extensive processing (Pearlstein, lecture 28 January 2014). Samples were prepared in the same manner as above. In some instances, the samples were macerated in order to separate fiber bundles for better viewing of fiber ultimates, by gently applying pressure in a circular motion to the coverslip with a pencil eraser. 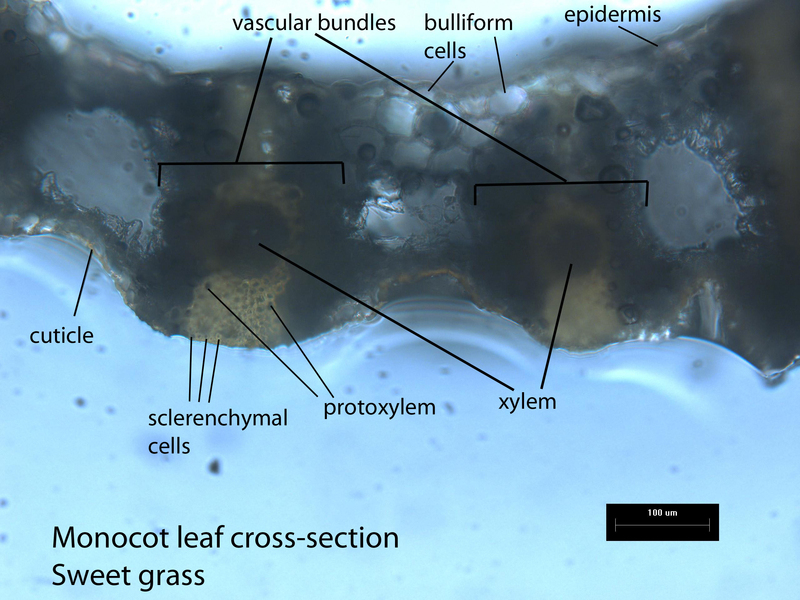 Cross Sectional Sample of a monocot leaf Monocot leaves from palms and grasses are commonly used culturally in the weaving of baskets and other structures. The leaves are quite strong due to the parallel veins and the strengthening sclerenchyma and vascular bundles corresponding to them. A waxy cuticle is present on the exterior, which contains natural, water repellent waxes, and is often removed during processing. 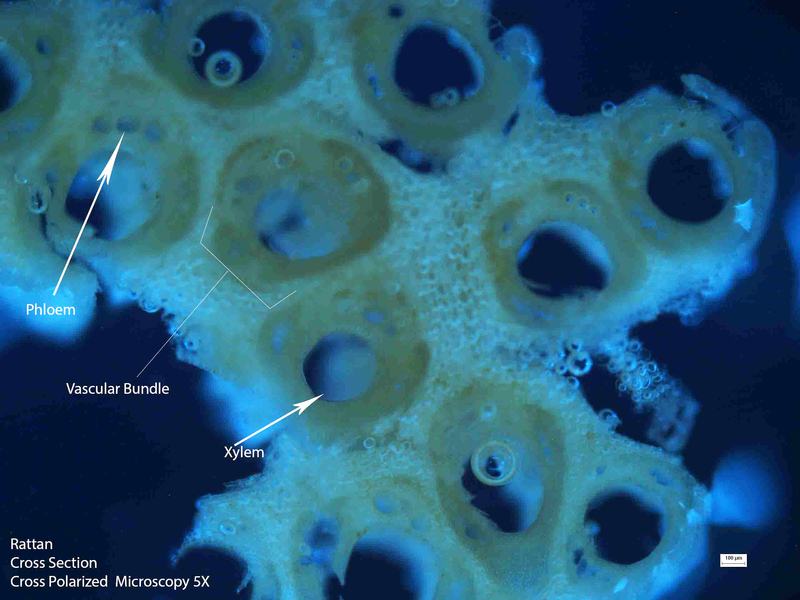 Observable characteristics of monocot leaves include the epidermis, vascular bundles (which include xylem and phloem cells), sclerenchyma bundles, and occasionally stomata, which are tiny mouths that permit transpiration (Pearlstein, lecture 28 January 2014)! 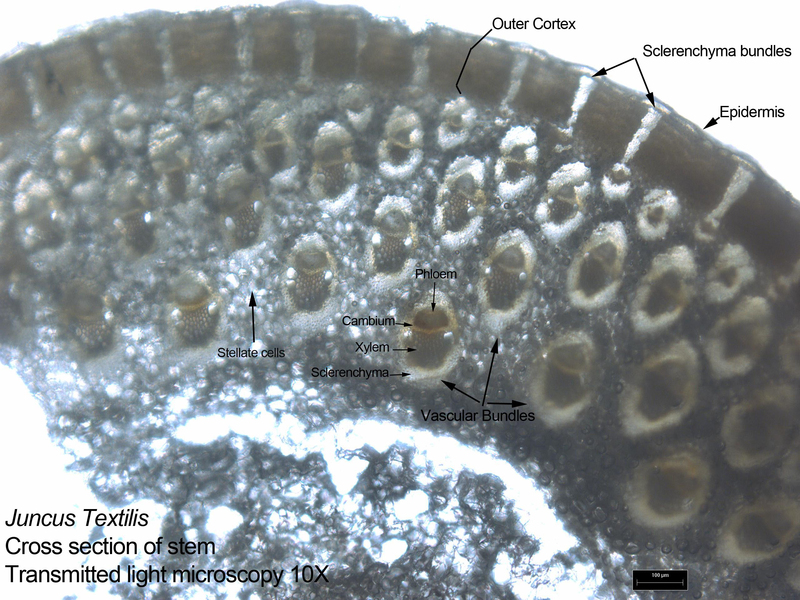 Samples were prepared by cutting a very thin slice from the end of a monocot leaf using a scalpel and carefully placing the sample on a glass microscope slide so that the cross section faced up. Once the sample was in the correct orientation, a drop of water was placed on the area around the sample and a plastic cover slip was placed on top. Cross-sectional sample of a Monocot Stem Monocot stems are also used in basket weaving and stems are obtained from grasses, sedges, rushes, and palms. Monocot stems do not develop bark on their exteriors and do not exhibit growth rings. 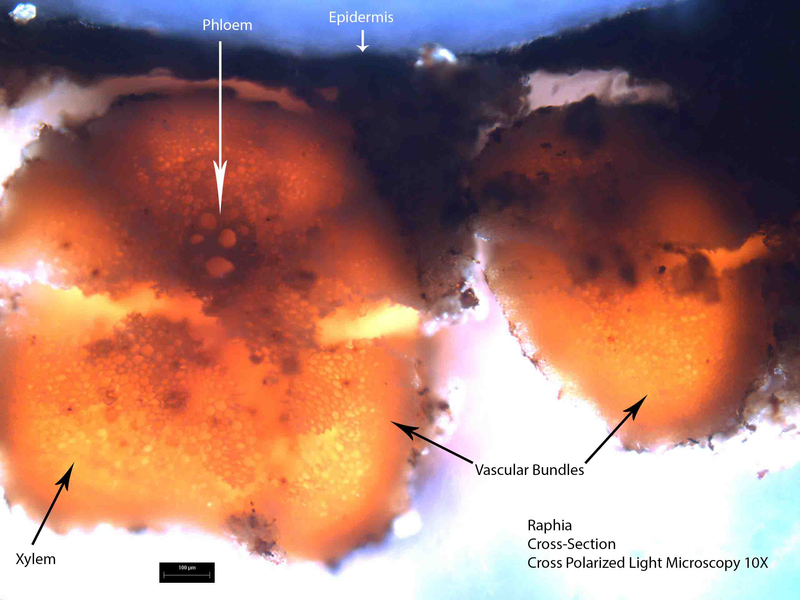 Identifying features observable in a cross-sectional sample include the outer cortex, vascular bundles (in which phloem, xylem and cambium may be visible), epidermal cells, and sclerenchyma bundles (Pearlstein, lecture 28 January 2014). Samples were prepared by cutting a very thin slice from the end of a monocot stem using a scalpel and carefully placing the sample on a glass microscope slide, followed by a drop of water and a cover slip. In addition to taking really beautiful and informative photomicrographs, students gained valuable experience with sampling techniques. The challenges of isolating single fiber ultimates or obtaining good cross sections on the reference materials, illustrated that much experience and care are necessary when taking samples from actual artifacts. Once students were able to see the differences between features, locating them without sampling was possible in some cases! References Florian, Mary-Lou E., Dale Paul Kronkright, and Ruth E. Norton. The Conservation of Artifacts Made from Plant Materials. Getty Publications, 1991. Pearlstein, Ellen (2014). Other Plant Materials, Lecture in Structure, Properties and Deterioration of Organic Materials, UCLA, Los Angeles, CA, January 28th , 2014. Categories: Courses, Structure, Properties and Deterioration of Organic Materials | Tags: microscopy, organic materials, plant fibers, polarize light | Permalink. In our first quarter class, CAEM 260: Structure, Properties, and Deterioration of Ceramic, Glass and Glazes, we were assigned a ceramic object on loan from Southwest Museum of the American Indian Collection, Autry National Center to examine, document, and treat the following quarter. 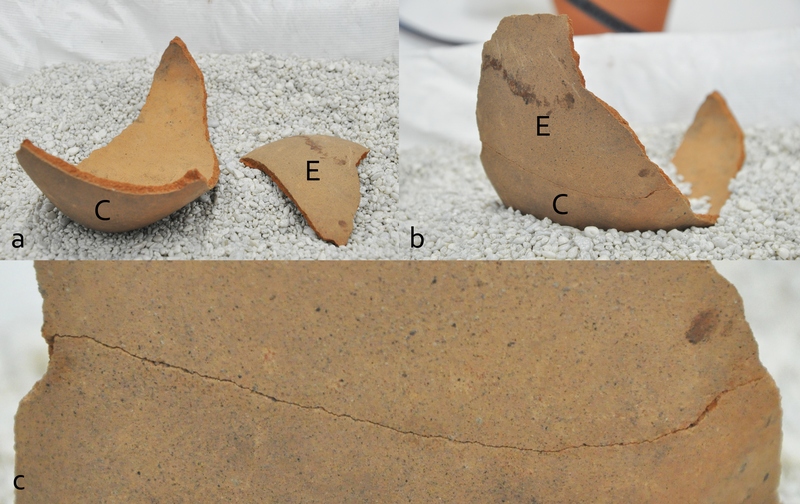 I was given a low-fired, light-colored Chiriqui vessel whose largest condition issue was its fragmentary state; the vessel was in 5 large fragments with additional small pieces in an accompanying bag (Fig. 1). As I would soon learn, assembling a broken vessel is not simply putting a puzzle back together and finding which pieces go where. The stress released as a vessel is broken can result in fragments that don’t quite meet up to complete the object as it was before—and I learned exactly how frustrating it can be to achieve tight and aligned joins with stubborn objects like this! Joining my vessel (with 40% Acryloid B-72 in acetone using a brush) went quite well in the beginning, such as with Fragments C and E (Fig. 2). I determined the best sequence would be to join Fragments C-E-A and Fragments B-D (Fig. 3). These two sections would then come together to complete the vessel…however this didn’t prove to be as easy as I had thought. I found that while one side of the join was well aligned and tight, the other side by comparison was like a mile-wide fissure as far as I was concerned (Fig. 4); a jolting discovery for a newbie in training! The two sections just didn’t fit, despite careful and tight joining of the fragments that comprised them. 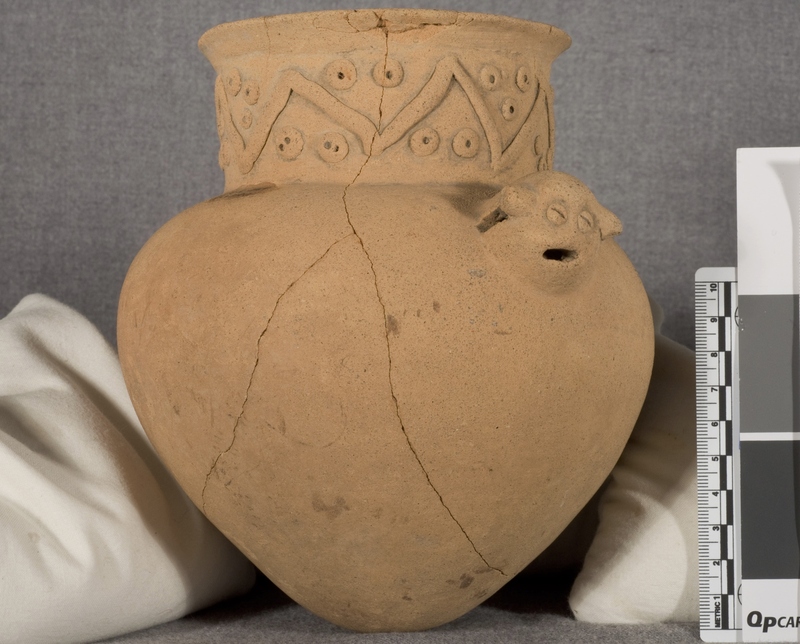 Any ideas I had about merely adding adhesive and piecing the vessel back together were naively simple and optimistic in hindsight, but fortunately lab manager and conservator, Vanessa Muros, was able to guide me through a more complicated (and at times scary! ), multi-stage aligning method involving heat and pressure. The misaligned fragments were adjusted using a hair drier (set to a low temperature) to soften the B-72, and then pressure was applied using 3M Coban self-adherent wrap and soft-grip clamps, with barriers of thin Ethafoam and Volara (Figs. 5-6); slow tightening of the Coban wrap was performed regularly using a wooden popsicle stick. This process may seem simple, but pressure was required in multiple directions and aligning one area often caused another to move and misalign; all joins had to be considered. It became a battle over control between what I wanted the fragments to do and how they naturally wanted to be, all while gauging the safety of the object and determining when enough was enough. In the end, relatively good joins were achieved overall (Figs.7-8). The changes that occurred from the stress released upon breaking still prevented perfectly tight and aligned joins everywhere, but the best compromise was achieved and the results were more than satisfactory. I was able to learn about the unforeseeable problems that can occur during the treatment of ceramics, and I gained a greater feel for the material and how it behaves…and I’ll be ready for the next one! Categories: Conservation of Ceramics and Glass Lab, Courses | Tags: ceramics, Chriqui, conservation, Southwest Museum of the American Indian | Permalink. The quarter is coming to end in a few weeks and our 1st year students are all getting ready to head off on their summer internships. “Where are they going?”, you ask. Take a look at the list below and see all the exciting places they’ll be working this summer. We hope they enjoy their time at their internship sites and we can’t wait to hear about it in the fall! Categories: 1st year-summer, Internships | Permalink. Here at the UCLA/Getty Program, we’re gearing up for the International Symposium on Archaeometry (ISA), taking place May 19-23. This year, the ISA is being held at both the Getty Villa and at UCLA, organized by UCLA/Getty Program chair Dr. Ioanna Kakoulli and Dr. Marc Walton, senior scientist at NU-ACCESS (and formerly a scientist at the Getty Conservation Institute). Our program is well represented at the conference, with several posters and paper presentations and faculty chairing various sessions. If you’re attending the conference, make sure to check out the presentations below by the UCLA/Getty crew. You can find more information on the conference here and the schedule and abstracts here. We’ll be posting pictures on our Facebook page so make sure to check out the album ISA 2014 throughout the week. We’ll also be posting on our twitter account @UCLAGettyCons using the hashtag #isa2014. Over the past few decades, research on geochemical characterization of obsidian archaeological artifacts and geological samples from the greater American Southwest has been extensive, primarily for provenance purposes (Shackley, 1995; Ambroz et al 2001; Eerkens and Rosenthal, 2004; Ericson et al., 2004; Eerkens et al., 2008). Using different analytical techniques, such as neutron activation analysis (NAA), inductively coupled plasma mass spectrometry (ICP-MS), and laboratory and handheld X-ray fluorescence (labXRF and pXRF), the elemental fingerprint of obsidian artifacts can be established and correlated to known geological sources. This paper presents preliminary results for the geochemical characterization of an obsidian assemblage from the Fowler Museum collections consisting of one hundred fifty-six obsidian samples from various sites in California. The assemblage was analyzed with a Bruker handheld XRF to determine the number of groups with different geochemical signatures. Data were compared to \geological and reference samples from known California, Arizona, and Eastern Oregon sources in an attempt to assign individual groups to specific obsidian sources. Using elements bivariate plots and multivariate statistics, and beside several outliers, six distinct obsidian groups were identified based primarily on the concentrations of iron (Fe) and some trace elements, in particular strontium (Sr), yttrium (Y), zirconium (Zr) and Niobium (Nb). Although obsidian source attribution remains challenging for such a diverse assemblage, one artifact group could be confidently assigned to the Obsidian Butte source in San Diego County while a large number of samples from obsidian-rich northern California sites cluster well with sources located within the Coso volcanic mountain range in central-eastern California. Finally, the results for these groups are discussed in terms of artifacts spatial and temporal distribution which provide useful insight on procurement patterns for this material in California. Oregon. Journal of Archaeological Science, 28, 741-746. Coso Volcanic Field, southwestern California. Journal of Archaeological Science, 31, 21-29.
signatures in the Owens Valley, California. Journal of Archaeological Science. 35, 668-680. California, USA. Geoarchaeology: An International Journal., 19, 8, 779-805. 1. UCLA/Getty Conservation Program, Los Angeles, CA, USA. 2. Dept. of History, Archaeology and Cultural Resources Management, Univ. of Peloponnese, Kalamata, Greece. 3. Cotsen Institute of Archaeology, UCLA, Los Angeles, CA, USA. 1. Conservation Center, Los Angeles County Museum of Art, 5905 Wilshire Blvd, Los Angeles, CA 90036, United States. 2. Department of Materials Science and Engineering, University of California, Los Angeles, 410 Westwood Plaza, 3111 Engineering V, Los Angeles, CA 90095-1595, United States. 3. 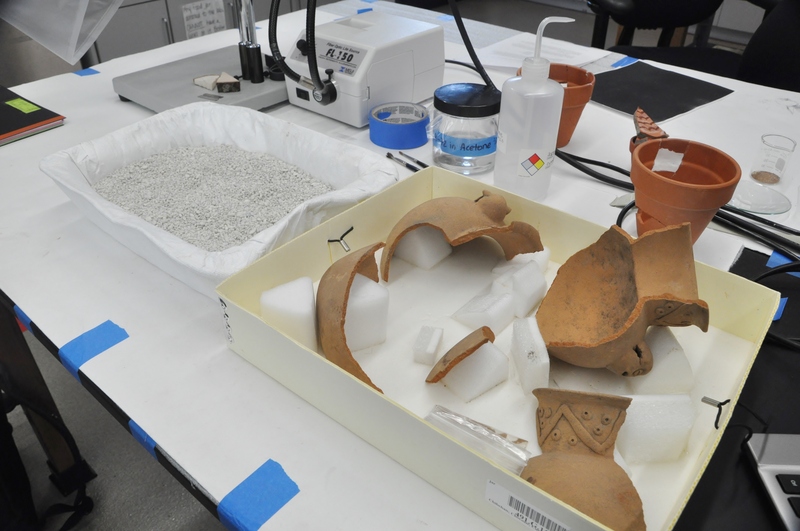 UCLA/Getty Conservation Program, Cotsen Institute of Archaeology, University of California, Los Angeles, 308 Charles E. Young Drive North A210 Fowler Building/Box 951510, Los Angeles, CA 90095-1510, United States. The site of Huaca Malena on the coast of southern Peru is a platform and cemetery of the Wari state from the Middle Horizon period (AD 700 -1100). The cemetery has yielded mummy textiles, some of which are typical for the region, and others with motif traditions indicative of the Sierra Andes of southeast Peru. It is unclear if this indicates migration, exchange, or transmission of aesthetics. 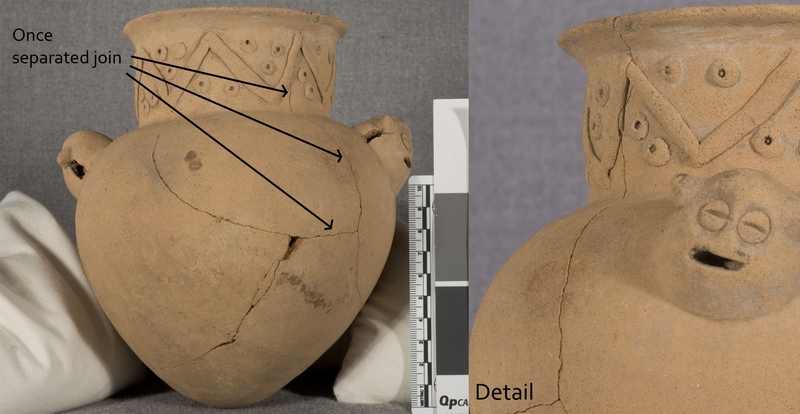 Analytical methods for the identification of organic colorants on archaeological textiles can offer a way to retrieve information from these delicate artifacts. 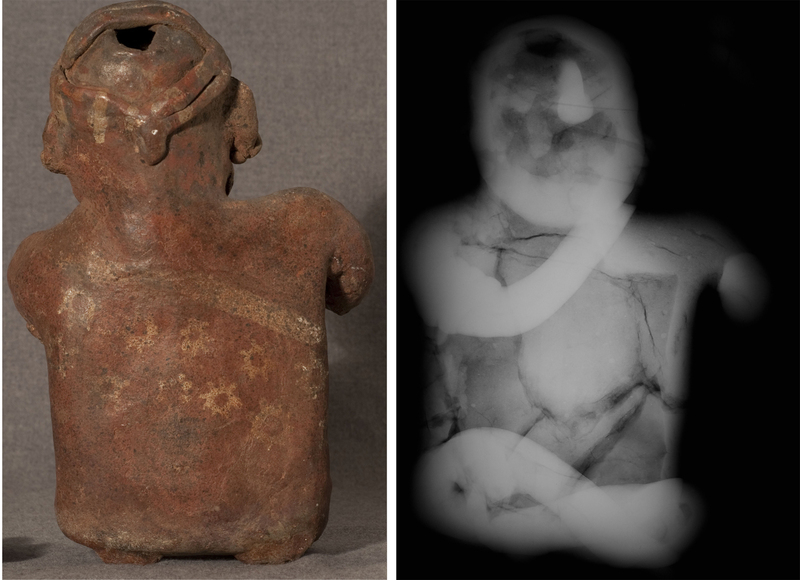 Among other analytical methodologies, Surface-Enhanced Raman Spectroscopy (SERS), achieving single molecule detection, has recently emerged as a powerful technique for the identification of colorants from size-limited and irreplaceable archaeological materials1. For direct, extractionless SERS analysis of colorants on textiles, silver nanoparticles (AgNPs) are deposited on a single fiber and SER spectra are acquired using a micro-Raman spectrometer (μRS)2. Since the deposition of AgNPs is a crucial step to generate the SER effect, Scanning Electron Microscopy (SEM) appears to be an ideal tool to evaluate the AgNP coverage and locate suitable areas for successful and reproducible analysis. In this study, direct, extractionless SER analysis of organic colorants on single fibers was performed for the first time using a μRS interfaced with a variable pressure SEM (VPSEM). An alpaca fiber dyed with Peruvian cochineal and a wool fiber dyed with Indian madder were treated with a silver colloid and introduced in the SEM chamber. The high resolution imaging of SEM was used to select areas showing diverse deposition of AgNPs. SERS analyses were then directly carried out in these areas without moving the sample. The analysis of areas with a thick layer of nanoparticles or without nanoparticles resulted in low signal to noise ratio or no signal at all. Areas with a thin layer of deposited nanoparticles led to optimal reproducible spectra characteristic of the dye molecules. The results clearly illustrated the potential of this quasi non-destructive approach for the identification of different organic colorants while information can also be obtained on the AgNP coverage as well as the morphology of the fibers. This methodology will be applied to study collections of Peruvian archaeological textiles including that from the site of Huaca Malena. 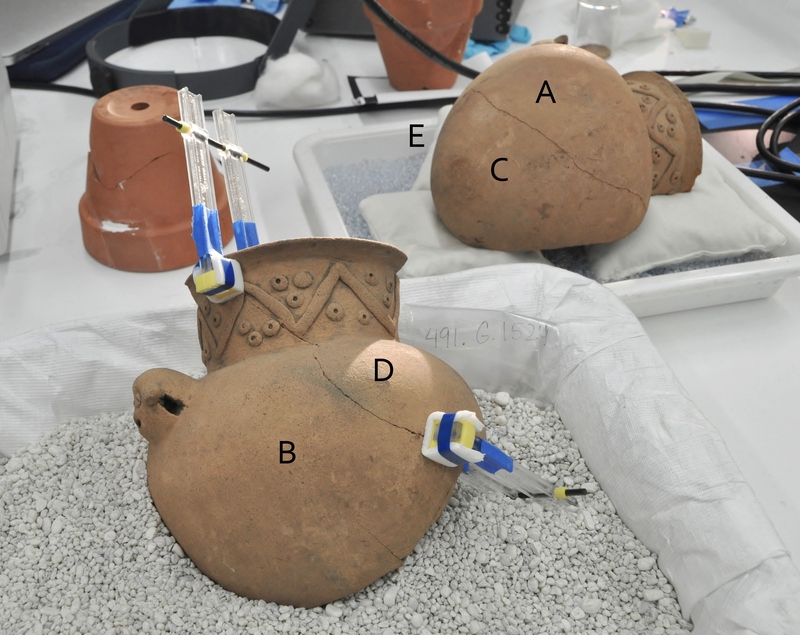 The application of VPSEM-µRS, coupled with energy-dispersive spectroscopy (EDS), will also provide a unique opportunity to study a variety of other archaeological materials including pigments, glazes, and glasses. 2. Brosseau CL, Casadio F, Van Duyne RP: Revealing the invisible: using surface-enhanced Raman spectroscopy to identify minute remnants of color in Winslow Homer’s colorless skies. 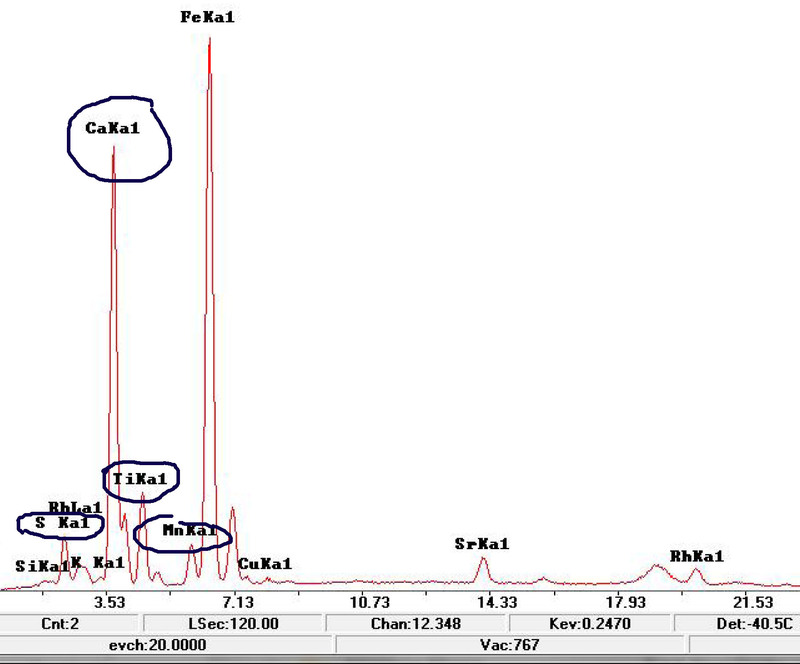 J Raman Spectrosc 2011, 42:1305–1310. 1. Cotsen Institute of Archaeology, UCLA, Los Angeles, USA. centers from which blue-and-white was exported followingnewly established global trading networks. The distinction between products from these two centers is of prime importance for archaeological research because it relates to topics such as trade routes, value or class. However while the provenance of complete porcelain pieces can often be easily identified from stylistic and technology-related features, attribution of small sherds to specific production sites remains a challenging task that requires a more in-depth analysis of the material. During the last decades, most scientific studies have focused on ware from official kilns (Yu and Miao, 1996; Wu et al., 2000; Wen et al., 2007) and only recently, owing to archaeological excavations of common kilns at both sites, useful reference data became available (Wu, et al., 2007; Ma, et al., 2012) providing solid support for provenance studies (Dias, et al., 2013). In the research presented here, blue-and-white porcelain sherds from Banten (Indonesia) and Visayan (Philippines) were analyzed with handheld XRF (p-XRF) and UV/Vis/NIR spectroscopy to acquire compositional data of the ceramic body, glaze and blue pigment and to evaluate the potential of these non-invasive and portable techniques at discriminating different source materials and production sites. Beside the expected use of Mn-rich cobalt ores for the blue pigment, p-XRF results have indicated that products from Jingdezhen and Zhangzhou common kilns can be successfully differentiated based primarily on the concentrations of some key trace elements such as Zr, Ti and Sr, most likely correlated to the composition of local raw material sources. The approach appears therefore promising and could offer a fast and cost-effective way for the characterization and sourcing of export blue and white porcelain sherds, especially for field analysis. DIAS, I.M., PRUDÊNCIO, I.M., PINTO DE MATOS, M.A. and RODRIGUES L.A., 2013. Tracing the origin of blue and white Chinese porcelain ordered for the Portuguese market during the Ming dynasty using INAA. Journal of Archaeological Science 40, 3046-3057. MA, H., ZHU, J., HENDERSON, J. and LI, N., 2012. Provenance of Zhangzhou export blue-and-white and its clay source. Journal of Archaeological Science 39, 1218-1226. WEN, R., WANG, C.S., MAO, Z.W., HUANG, Y.Y. and POLLARD, A.M., 2007. The chemical composition of blue pigment on Chinese blue-and-white porcelain of the Yuan and Ming dynasties (AD 1271-1644). Archaeometry 49, 1, 101-115. WU, J., LEUNG, P.L., Li, J.Z., STOKES, M.J. and LI, M.T.W., 2000. EDXRF studies on blue and white Chinese Jingdezhen porcelain samples from the Yuan, Ming and Qing dynasties. X-ray Spectrometry 29, 239–244. 1. Division of Archaeology, Department of History, Nanjing University, Nanjing, China. 2. Division of Archaeology, Nanjing Municipal Museum, Nanjing, China. 3. Conservation Lab, Archaeological Institute of Shaanxi Province, Xi’an, China. One of the significantly archaeological discoveries in the year of 2011 in Nanjing city, China, was a grand brick chambered tomb dated to 317-420A.D., associated with many spectacular findings, such as golden ornaments, lacquer vessels, natural beeswax, celadon containers, alchemical pills, as well as other metal objects. In terms of historical documentation, the tomb location belonged to a cemetery of a high rank honorable family, mostly presumed to be well-known alchemical pioneers and active practitioners during the Eastern Jin Dynasty (317-420A.D. ), a flourishing period of Taoism in ancient China. Aided by local archaeologists, a metal incense burner composed of a bird-formed lid, a body decorated with birds and human production shaped figurines and a plain basin-patterned base with an auspicious animal lying in the center, was chosen to be firstly explored by scientific methods. The whole vessel was well preserved and nearly intact, except base edge with a small-sized cut. 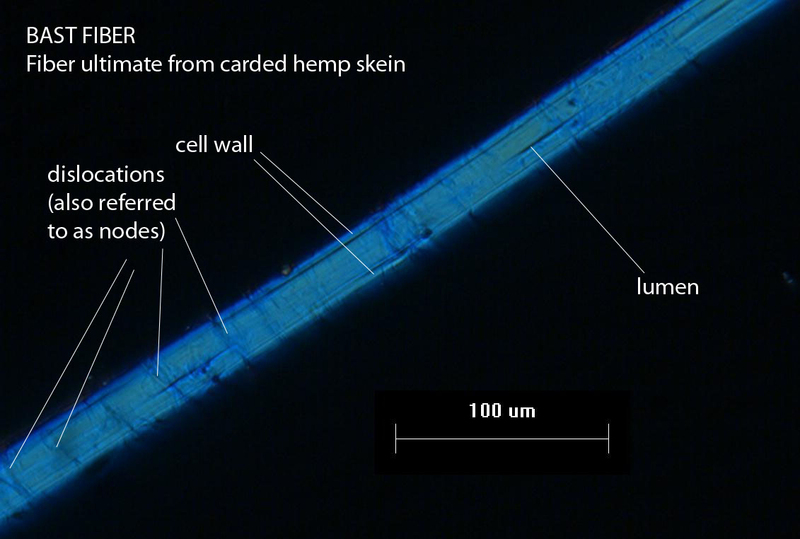 Therefore, a tiny piece along the cut was sampled and analyzed by using x-ray fluorescence, μ x-ray fluorescence, metallographic microscopy, as well as scanning electron microscopy coupled with EDS to determine the composition, structure and manufacturing technology. The semi-quantitative x-ray fluorescence analysis showed the sample mainly had copper, silica, tin, lead, iron and aluminum, with potassium, chlorine, calcium and phosphorus in minor. After detection by using μ x-ray fluorescence on a fresh section, map scanning revealed copper was mostly rich in the whole body, with minor evenly distributed tin and dottedly distributed lead, whereas other elements including silica, aluminum, potassium, chlorine, calcium and phosphorus were mainly found along the surface, which were attributed to the contaminants from the burial soils, and iron probably due to an adjacent iron ink slab. 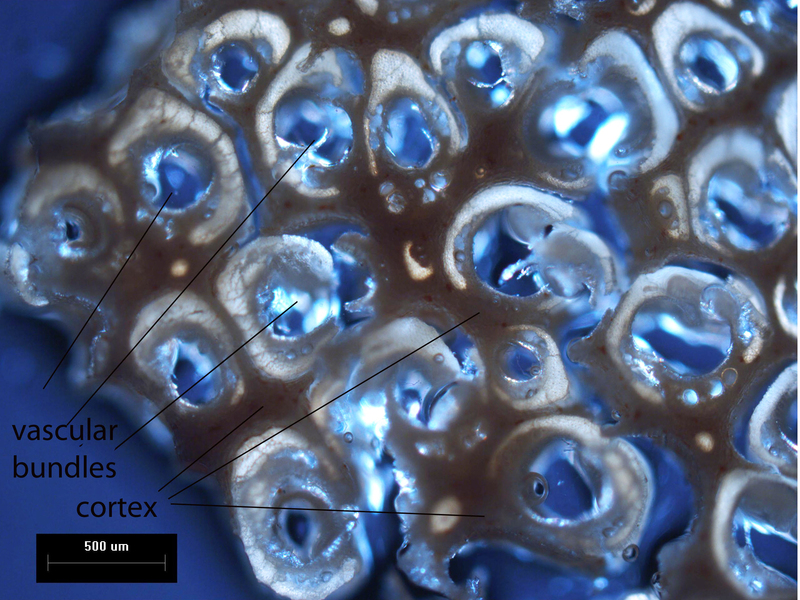 The metallographic observation unveiled a typical dendritic casting microstructure, but dendritic segregation was unobvious because of low tin content. The results conducted by scanning electron microscopy equipped with EDS were in consistent with metallographic observation and μ x-ray fluorescence result, especially EDS analysis indicated tin content was averagely over 4%, whereas lead was 1% to 2%. The experiments revealed the burner base was mainly made of copper by casting technology; tin was purposely added in; lead was probably spontaneously brought in from either copper ores or remelting process. It was different from local archaeologist’s original opinion, which was inclined to be an artifact made of pure copper, referenced from a historical record written by contemporaneous alchemists, one of whom was mostly presumed to be the potential tomb owner. 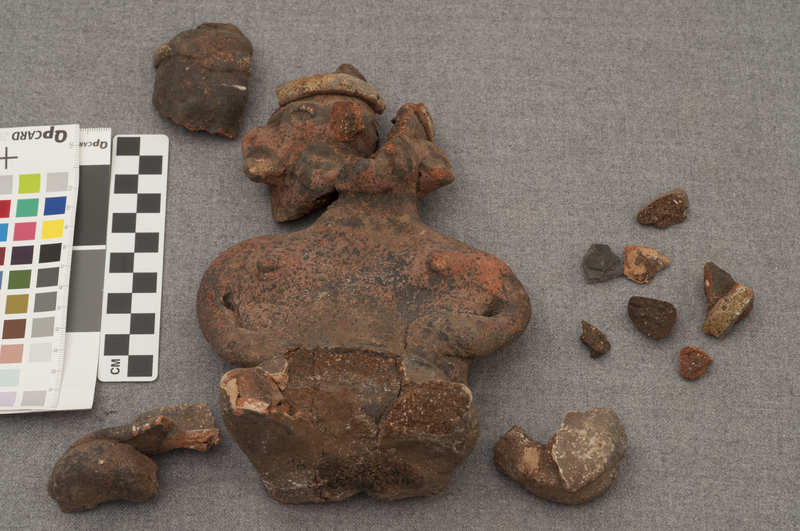 However, deep investigation needed to be performed on diverse parts of the burner together with other excavated artifacts in order to seek more powerful evidence to provide a reasonable answer. Categories: ISA 2014 | Tags: archaeometry, conservation, ISA2014 | Permalink. Last quarter we both had the opportunity to treat pre-Columbian Nayarit ceramic figurines from Mexico, on loan from the Southwest Museum of the American Indian Collection, Autry National Center. At first glance we thought the treatment would be pretty straightforward, but after a closer look it appeared to be anything but! 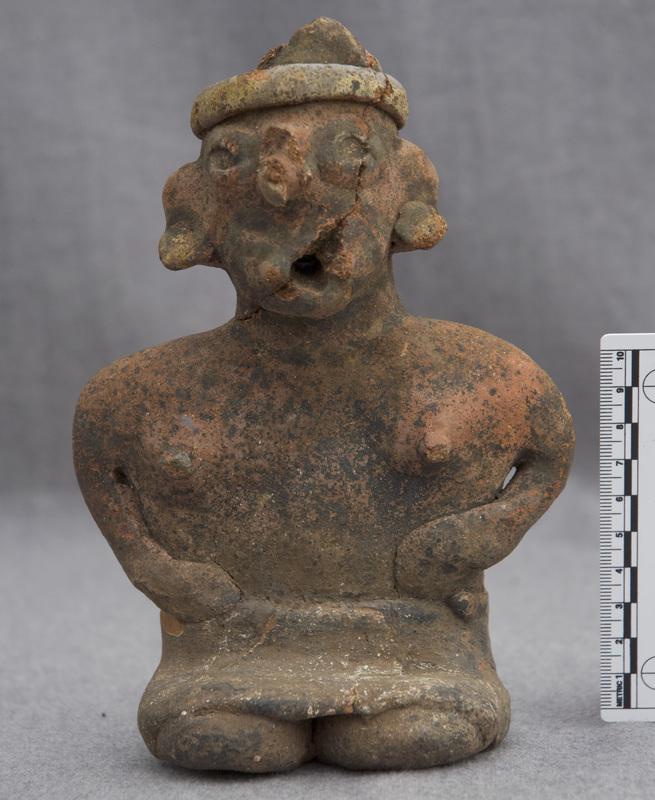 The surface and structure of the figurines are deceptively highly restored, which can be common for artifacts passing through the art market. In addition to reassembling the fragmented figurines, our goal is to document and identify old from new, and shed light onto the unknown pasts of these objects. We’re approaching the project with a range of tools including X-ray imaging, UV-induced visible fluorescence imaging, X-ray diffraction (XRD) analysis, and X-ray fluorescence (XRF) spectrometry. 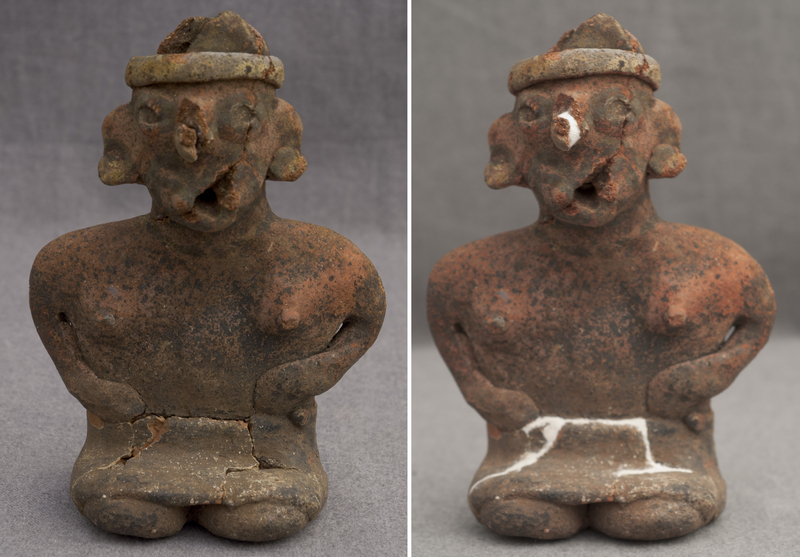 XRF analysis indicates the presence of lead and zinc on the surface of both figurines, which are common in modern pigments, though typically not found in pre-Columbian ceramics. Using XRF and XRD, we also detected the presence of plaster in some areas, a common restoration material for ceramics. While we work to try to piece our puzzles together, take a look at our projects! Categories: Conservation of Ceramics and Glass Lab, Courses | Tags: ceramic, CrimeScope, Mexico, Nayarit, radiography, restoration, UV | Permalink.